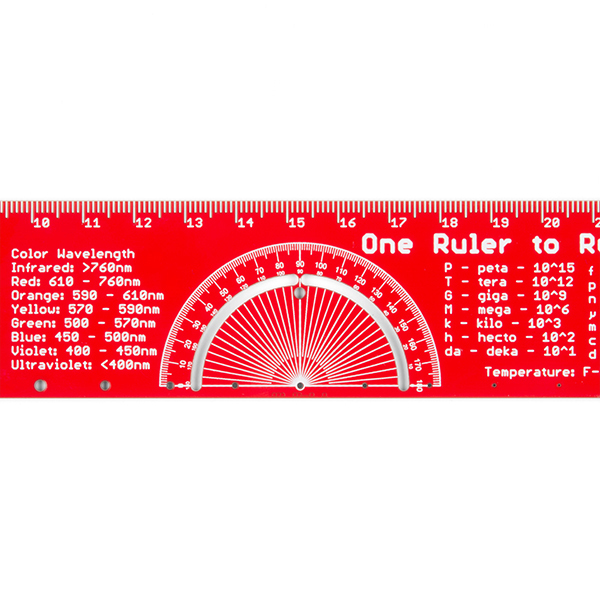 One ruler to rule them all. 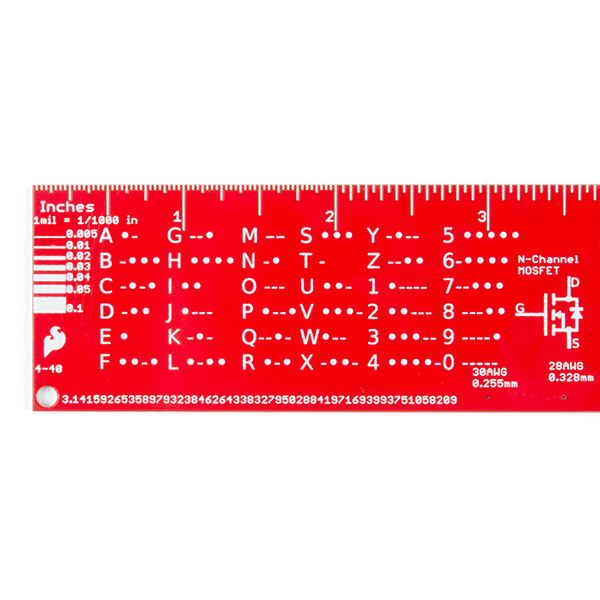 This is a basic 12 inch ruler, but made from a PCB. 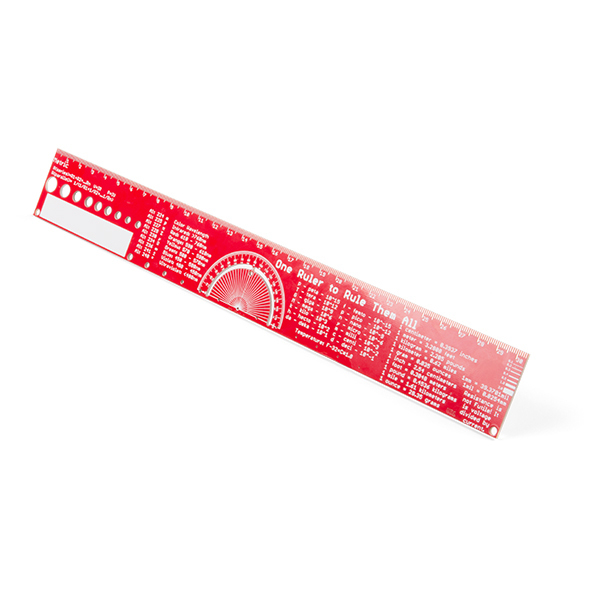 We have included a lots of useful information on each side of the ruler that you might use on a daily basis including Wire Gauge holes, transistor diagrams, common fractions, Roman numerals, and metric to imperial conversions. Most importantly, the ruler provides you with a straight line and centimeter markings one side and inch markings on the other side. 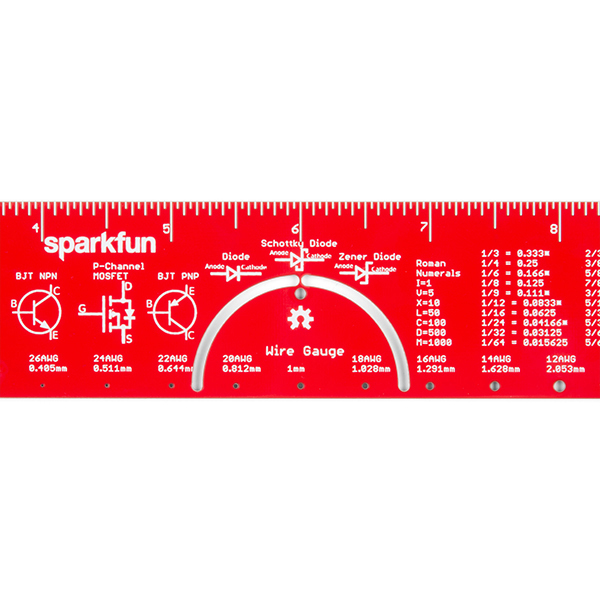 You'll also find a small protractor in the middle for all your angle measurement needs. 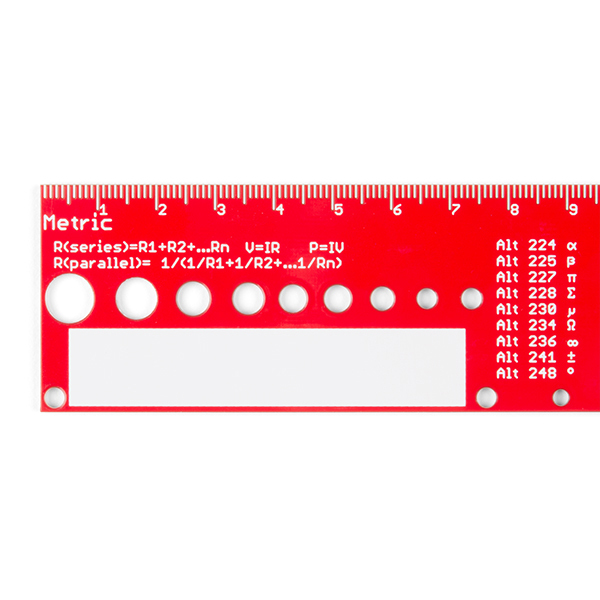 While we figured you have a fairly good idea how to use a ruler we do have a tutorial to explain all the information you'll see! 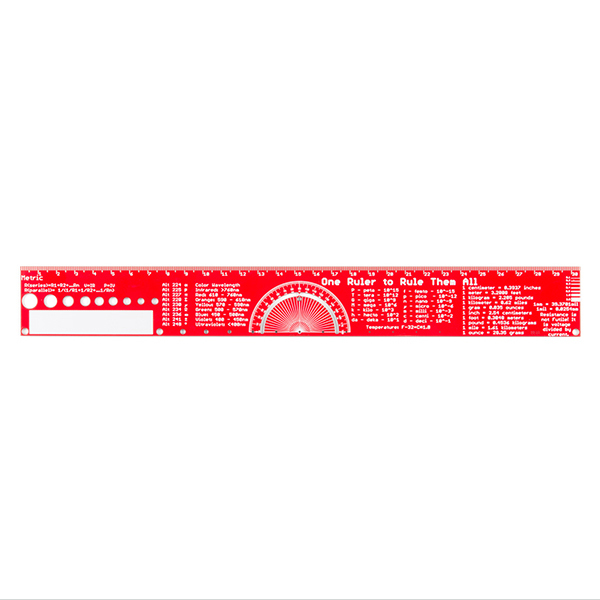 12 inch PCB ruler with markings down to 0.05" or 1/32"
I did consider doing 10<sup>-6</sup> instead of 10^6. 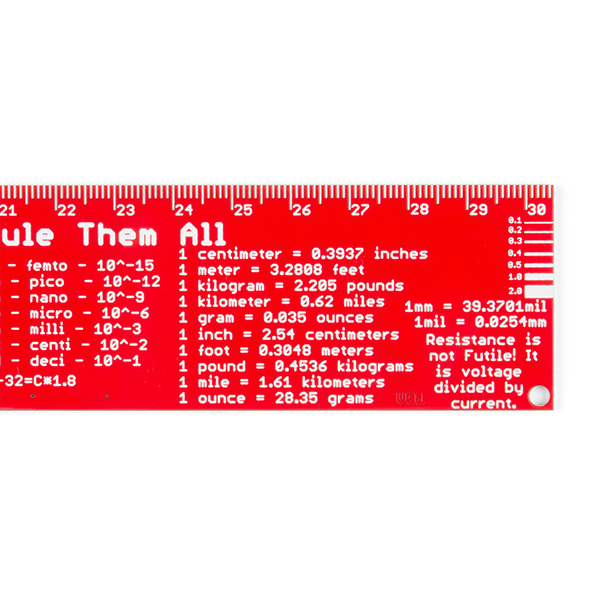 I agree it is generally easier to use I didn't want to make the exponent too small on the ruler since that is the number you actually want to see. I actually don't think I've ever heard of ELI the ICE man, not sure how I missed it. I'll definitely consider the others if we do a revision though. 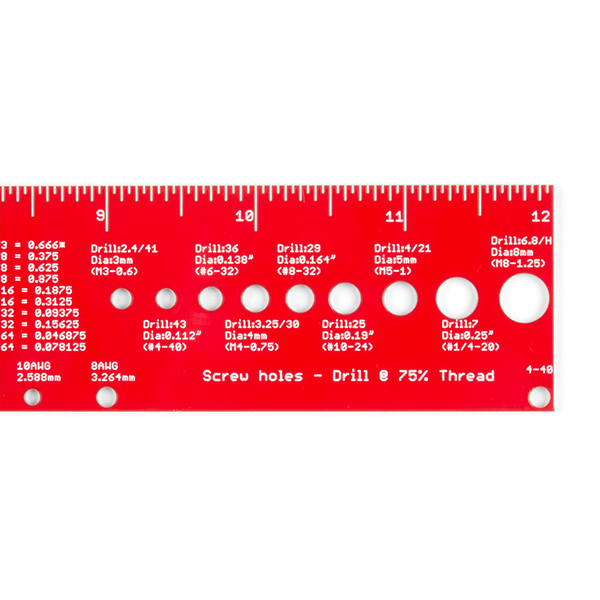 Although I like the idea of this ruler, and will likely include one in my next order, it has the same problem as Adafruit's six inch PCB ruler that I've had for over 5 years: I'd really like to see a series of various sizes of PTH through holes so I can quickly test leads to guage what size drill I should call out to fit that particular part when I'm designing a PCB. If you decide to "respin" this one, please add that! Hmm, I have drill sizes and wire gauge, but not that, I'll definitely consider that for a 'respin'.